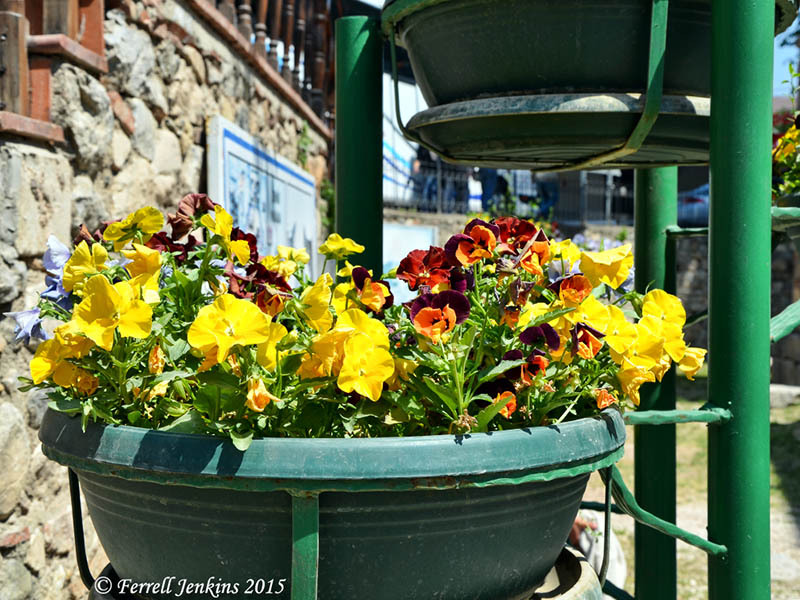 This planter of beautiful flowers is one of several that adorn the entry to the Saint Sofia (Orhan) Mosque in Iznik, Turkey. Iznik is the site of Nicea (Nicaea), the location of the famous Council of Nicea in A.D. 325, and the Second Council of Nicea in A.D. 787. Flowers in front of Iznik Ayasofya Mosque. Photo by Ferrell Jenkins. The Mosque has a long, typical history. Originally the site was the location of a Roman temple. Then in the 4th century A.D. the church of Saint Sofia was erected. In A.D. 1331 the building became a mosque. This is a common occurrence in the Middle East. 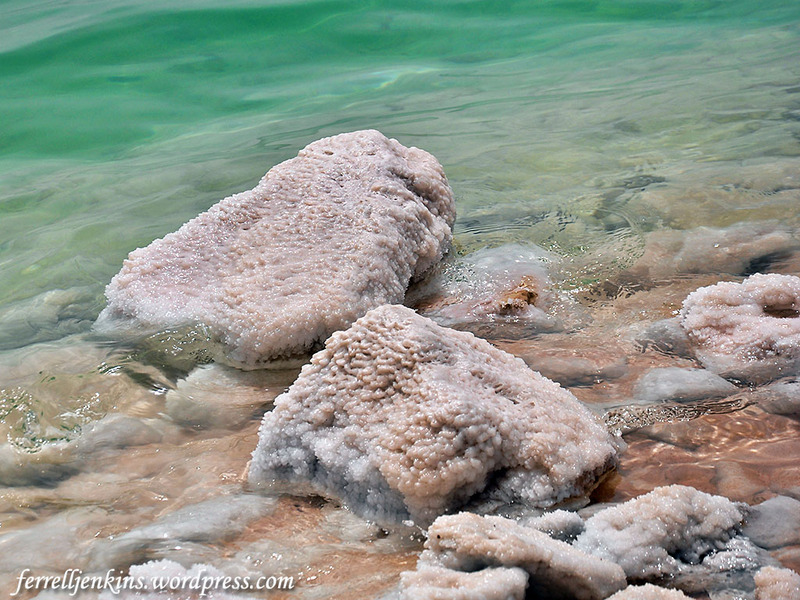 The Dead Sea has received much attention in the past few years due to the fact that it is the lowest body of water on earth, and that body of water is drying up. 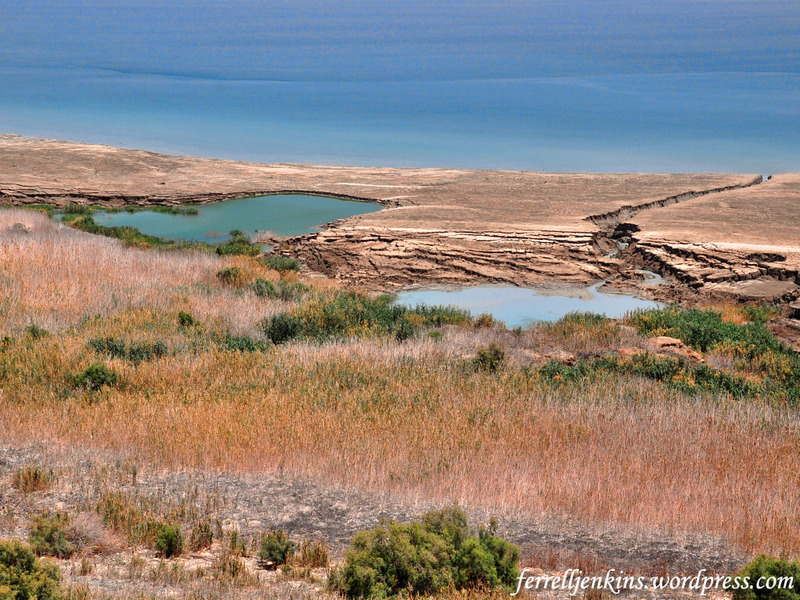 Melanie Lidman, writer for The Times of Israel, prepared a series of three articles about the Dead Sea drying up last month here, here, and here. Sinkholes along the shore of the Dead Sea. Photo by Ferrell Jenkins. Scientists who drilled 450 meters (1,500 feet) into the floor of the Dead Sea announced this week that the region may have been affected by “epic” centuries-long droughts, much worse than researchers previously believed. The study, led by Columbia University’s Lamont-Doherty Earth Observatory and scientists from six countries, examined a geological sample revealing more than 200,000 years of climate history in the Dead Sea region. The scientists studied the thickness of the salt layers, as well as liquid bubbles trapped in the layers of salt, to determine precipitation and runoff to the Dead Sea, uncovering some alarming trends. According to the study, the region experienced two major drought periods when rainfall and runoff patterns were at some points less than 20% of the average rainfall for the 20th century. You must go to the article here to see the photograph of a sample of the geological core from the Dead Sea. A report with the same photograph made be found on the page of the Lamont-Doherty Earth Observatory here. Last year we called attention here to a fabulous article by Nir Hasson in Haaretz. Salt on the rocks along the shore of the Dead Sea. Photo by Ferrell Jenkins. We have enjoyed several tours to Ireland. Some were in combination with the British Isles and others were limited to Ireland. The key words were lush, green, and beautiful. 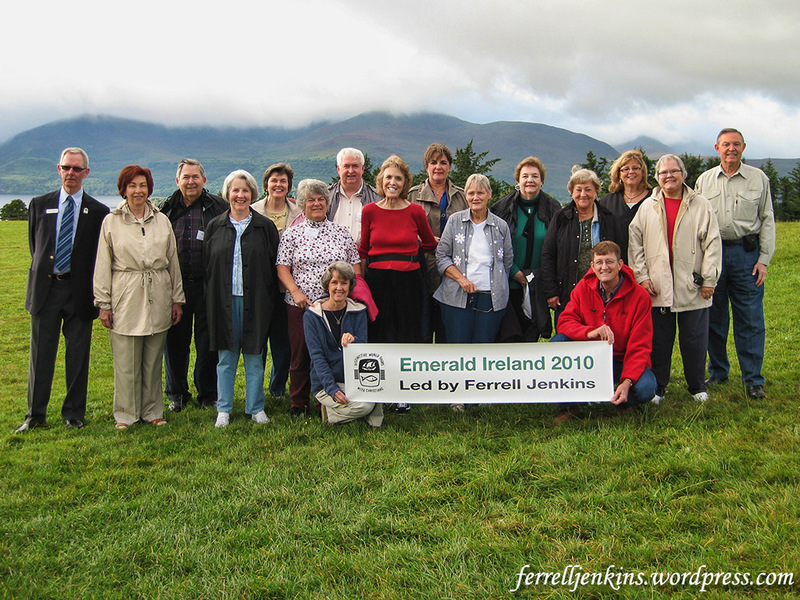 Ferrell Jenkins Tour Group along the Ring of Kerry in 2010. It is estimated that a further one million immigrated to countries such as Canada, U.S.A, U.K & Australia. Sadly not all passengers made it to their final destination alive. 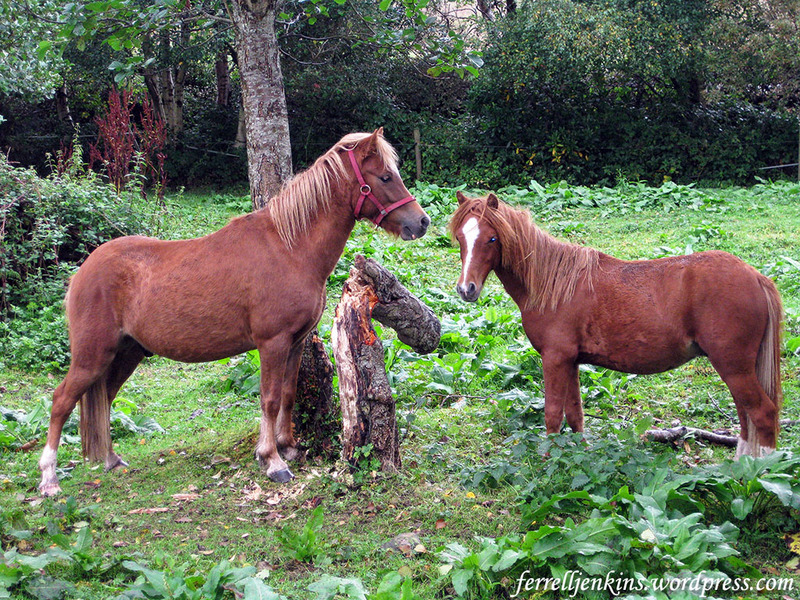 Bog Ponies at the Kerry Bog Village. Photo by Ferrell Jenkins. Colonel Matthew Lyon (Revolutionary War) was one of the forebears of my maternal grandmother. He was born in Wicklow County Ireland, in 1746 and came to America in 1755. His portrait hangs in the Vermont State House. In the autumn of 1985, remains of a 2400 year old merchantman were discovered in shallow water off the coast of Kibbutz Ma’agan Mikhael. A thick layer of sand and a large quantity of ballast stones covered the ship, thus protecting the wood and other perishable materials, from the elements. Three seasons of excavation (1988-1989) were conducted by marine archaeologists from the Center for Maritime Studies of the University of Haifa and volunteers. After a long process of conservation the ship was placed on display in The Ma’agan Mikhael Ship Wing of the Hecht Museum. The vessel measured approximately 12.5 m. long and 4 m. wide and had a load capacity of about 15 tons. Thirteen tons of stones and rocks were found during the excavation, the majority being bluechist. “It was used for roofing, flooring and for decorative articles” and originated from the Greek island of Euboea, northeast of Athens. All of my information comes from signs displayed in the Hecht Museum. The Ma’agan Mikhael ship displayed in the Hecht Museum. Photo by Ferrell Jenkins. Word comes that the a replica of the ship has been reconstructed and that it will be displayed for the press Friday, March 17. Here is the Press Invitation which explains about the reconstruction. 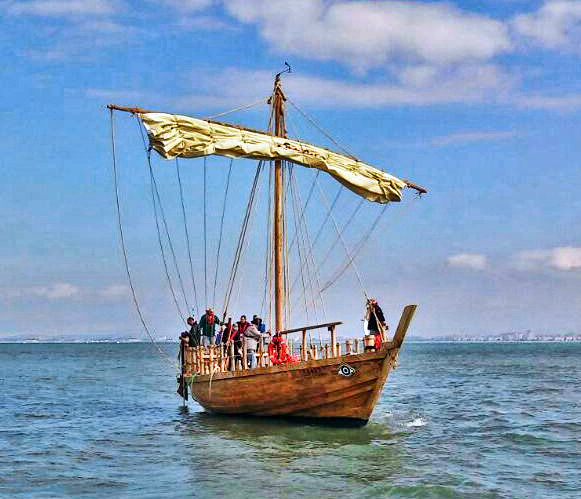 The Ma’agan Michael Ship is “going back” in the water: 2500 years after the ship sank off the coast at Ma’agan Michael, and 30 years after the shipwreck was discovered and removed from the water, a replica of the vessel will be launched. The official launching ceremony will take place this coming Friday (17 March 2017) and will be organized by the University of Haifa and the Israel Antiquities Authority. The replica was built over the past two years, using exactly the same materials, working methods, and tools that were used 2500 years ago. The Ship launching ceremony will be attended by the President of the University, Professor Ron Robin, the Director of the Israel Antiquities Authority Mr. Yisrael Hasson, ship builders staff, volunteers and their families. According to the ancient practice of launching a new ship into the sea, oil and water to be poured into the sea for good luck (“Blessing Poseidon”), and it will set sail (weather permitting). Ma’agan Michael replica. Photo courtesy of the University of Haifa. The ancient Ma’agan Michael Ship has always been a star. It was discovered in 1985 by Ami Eshel, a member of Kibbutz Ma’agan Michael, some 70 meters from the kibbutz. The ship was removed from the sea in 1988 in a project directed by Dr. Elisha Linder, one of the founders of the Department of Maritime Civilizations at the University of Haifa. Most of the ship had been covered in sand, helping to preserve it in a remarkable condition. The keel, numerous wooden plates, 14 crossbars, and the base of the mast were all preserved, offering researchers rare insights into the method used to construct the ship. In addition, the preserved tools found in the ship included the carpenter’s toolbox, a discovery that sparked the dream of building a replica using the same methods and tools used by the original shipwrights. In a complex procedure undertaken at the University of Haifa, a special preservative was inserted into the wooden base of the ship, which received its own display room at the university’s Hecht Museum. 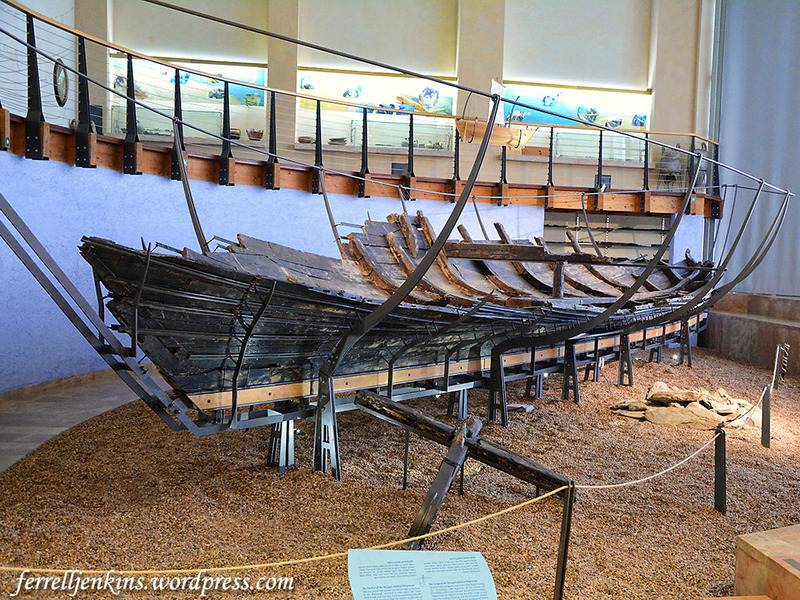 The late Prof. Yaacov Kahanov of the Department of Maritime Civilizations at the University of Haifa did not abandon the dream of building a replica of the ship. Prof. Kahanov was a young research student when the ship was taken out of the water. Two years ago, he finally began the work of building a replica, together with Avner Hilman of the Israel Antiquities Authority, for whom the use of the ancient working methods formed part of a doctorate thesis. Together with a team of volunteers, they began the work, most of which took place at the Naval Academy in Akko. However, the team working on the replica project soon encountered a problem. While they were familiar with the basic principle of the work – assembly using bolts and sockets – the other details were lost in the mists of time. They were unsure of the proper and most efficient way to bend the wooden beams in order to create the curved shape of the ship; the most suitable type of wood for the mast; and the precise temperature to which the copper nails should be heated. In many cases the team worked on a trial and error basis until they produced the desired result. Ma’agan Michael-replica. Photo courtesy of the University of-Haifa. After two year’s work, the project was completed successfully and the replica was taken to Israel Shipyards and then to Kishon harbor. 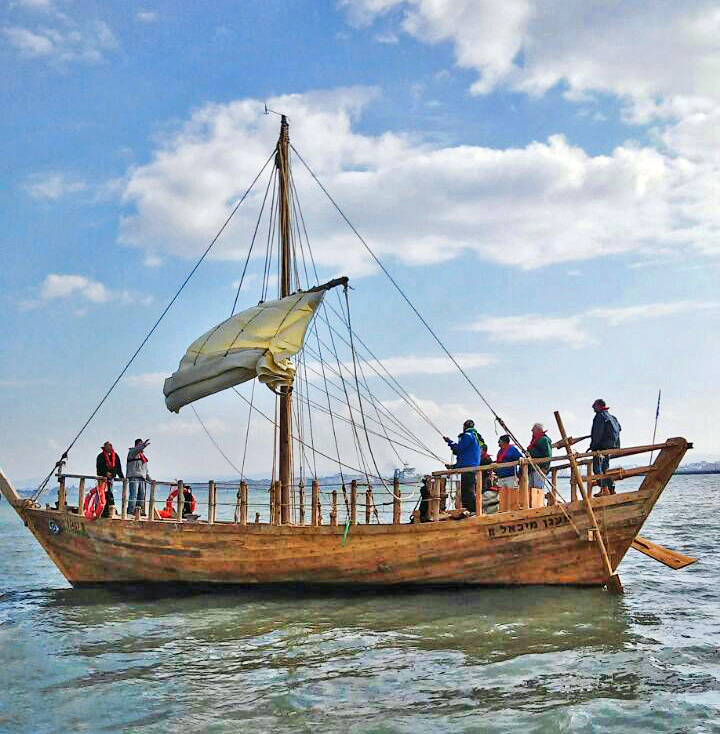 The ship will be officially launched at the harbor according to all the proper ceremonies and will return to the waters where its elder sister sailed 2500 years ago. Prof. Yaacov Kahanov, the leading spirit behind the project, passed away just before the work was completed. The launching ceremony will take place on Friday, 17 March 2007, from 10:00 a.m. at Shavit fishing and sailing harbor in Haifa – Nachal Kishon. We invite you to cover the event. The Nachal (River) Kishon is where the LORD defeated Jabin and Sisera at a point several miles east of the mouth of the river (Judges 4-5; Psalm 83:9). I wish I could be there to see the ship launched. A reader who read our report on the dolmen field in the Golan Heights ask on Facebook if these structures could be the high places or altars mentioned in the Old Testament. The simple answer is “No.” They are thought to be tombs. This photo of a dolmen was made at Gamla in the Golan Heights. Dolmen at Gamla in the Golan Heights. Photo by Ferrell Jenkins. Another strange sight on the Golan is fields of dolmens. Throughout the Golan, hundreds of dolmens are visible on the horizon. They are made of huge unworked basalt slabs and resemble giant stone tables. In fact the word dolmen derives from two Old Breton words—dol, meaning table, and men, meaning stone. 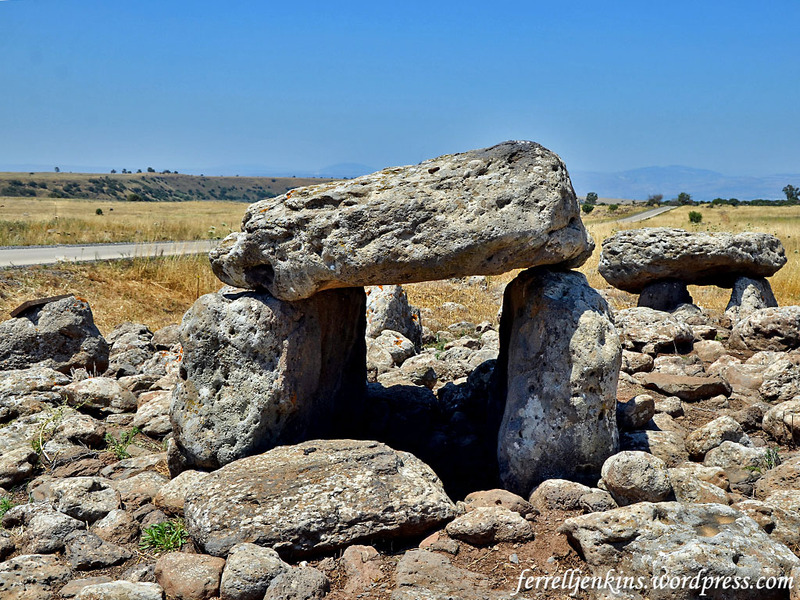 Dolmens were built to serve as tombs. Because of the absence of any associated contemporary house remains, we infer that the dolmen builders were nomadic or seminomadic tribesmen. The Golan dolmens vary in size, ranging from those built of three or four large boulders to the giants measuring over 20 feet wide and rising to heights of over 10 feet. Some dolmens are free-standing, but many others are partially—or completely—covered by stone heaps, or tumuli. Still others are surrounded by circles of stones. In 2009 we excavated an undisturbed dolmen in Jordan at Tall el-Hammam and recovered 16 EB whole vessels. We did not discover any skeletal remains and so hypothesis they were family memorials and used the table top to de-flesh the remains before reburial. The chamber inside the dolmen where the engravings were found on its ceiling is large, measuring 2 × 3 meters, and the stone covering it is also huge, weighing an estimated fifty tons at least! This is one of the largest stones ever used in the construction of dolmens in the Middle East. The dolmen was enclosed within an enormous stone heap (tumulus) c. 20 meters in diameter, and its stones are estimated to weigh a minimum of 400 tons. At least four smaller dolmens that were positioned at the foot of the decorated dolmen were identified inside the stone heap. In other words, what we have here is a huge monumental structure built hierarchically (with a main cell and secondary cells). This is the first time such a hierarchical dolmen has been identified in the Middle East. The engravings that were exposed on the inside of the built chamber. Photographic credit: Gonen Sharon, Tel Hai College. There is much more to learn about the dolmen. 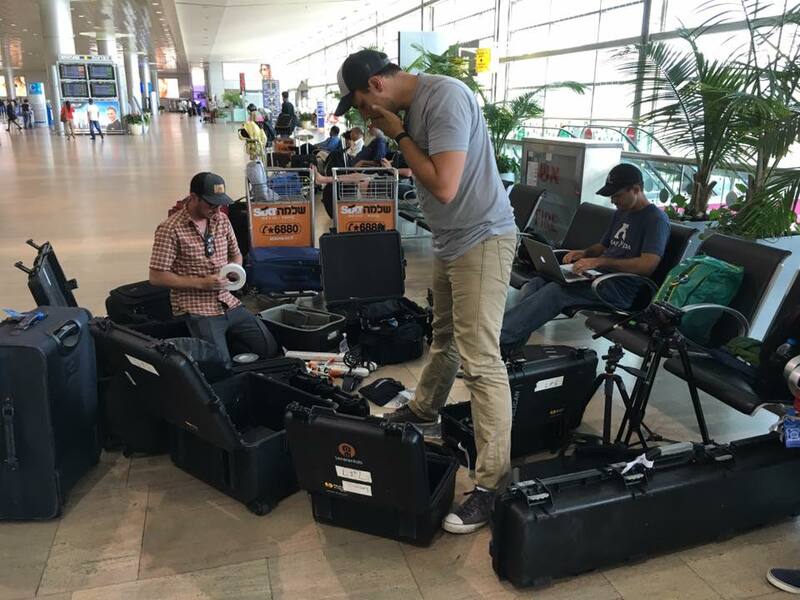 Tuesday brought another press release from the Israel Antiquities Authority. 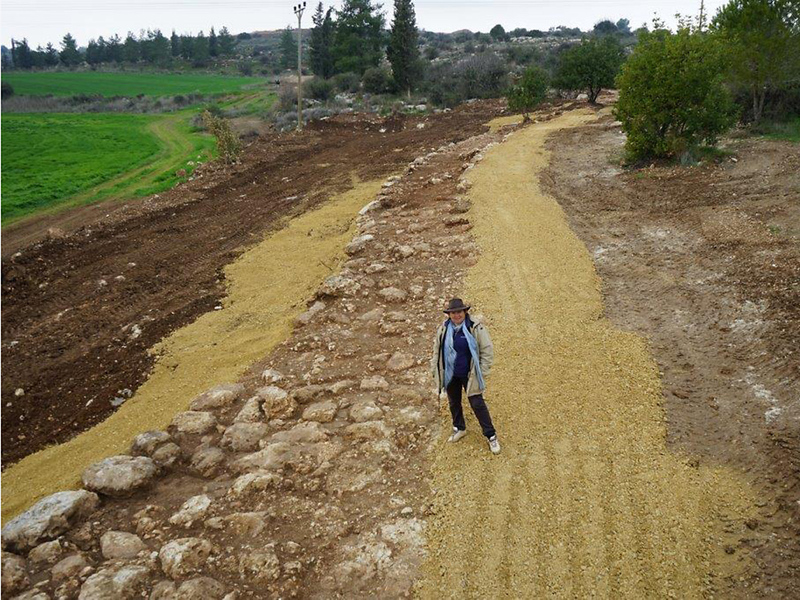 The headline of the release calls this “a 2,000 Year Old Road,” but the text states that its’ construction is dated to the time of the Roman Emperor Hadrian (A.D. 117-138). Aerial photographs of the road in the lower right corner of the photo. 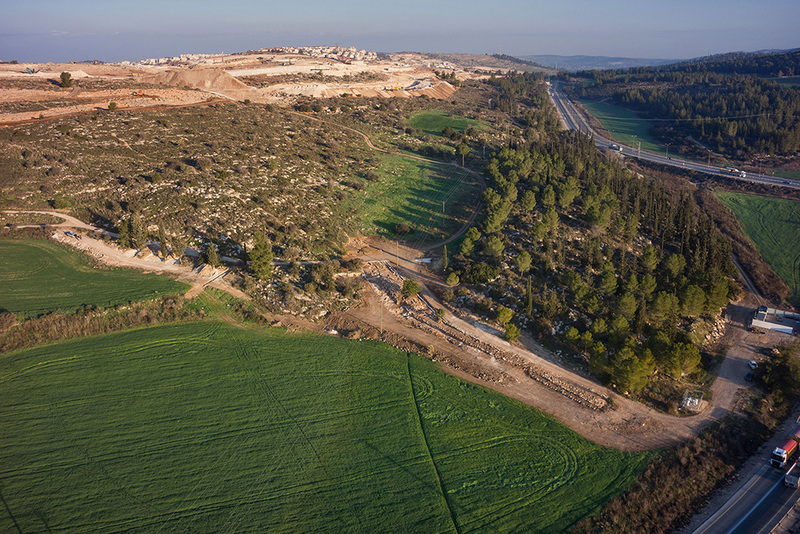 Photographic credit: the Griffin Aerial Photography Company, courtesy of the Israel Antiquities Authority. The ancient coins that were discovered in the excavation. Photographic credit: Clara Amit, courtesy of the Israel Antiquities Authority. The coin at the top is from the Umayyad period (A.D. 661-750). Bottom row (left to right): Herod Agrippa I – A.D. 41; Pontius Pilate – A.D. 29; Jewish Revolt – year 2 – A.D. 67-68. 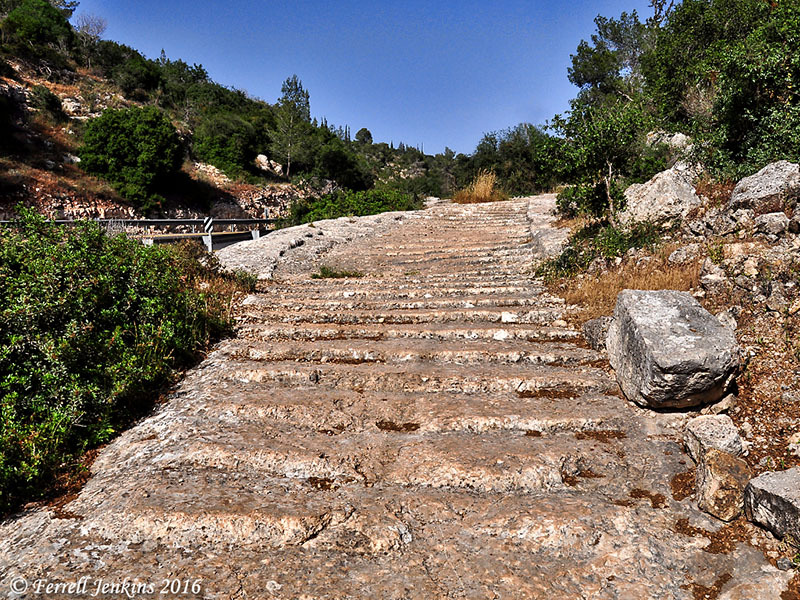 Just a few days ago Todd Bolen called attention to David Bivins reports on the gradual destruction of the Roman road from Jerusalem to Emmaus here. The situation there is tragic. I have witnessed some deterioration of the Roman road near Golani Junction in just a few years. Let’s hope that the situations here will be reversed, and that this road will be preserved for many to see. This recently uncovered road apparently connected with the road we described here. I find it especially interesting that coins from A.D. 29, 41, and 67-68 should be found on a road constructed in circa A.D. 130. Others can fill in possible answers. The roman roads that we see in Israel today were not built until about the time of the first revolt – ca. A.D.66, and mostly in the second century under Trajan and Hadrian. mention anything relating to road construction or maintenance before the beginning of the rebellion in 66 C.E. We may conclude, therefore, that the subject was not of central concern to the Roman procurators. (Israel Roll, “The Roman Road System in Judaea,” Jerusalem Cathedra 3 (1983): 138. My thought is that the later Roman roads generally followed paths that were already in use by the people.